Connectors came out great and fit perfectly! Only issue I had was with the Z-shaped part; the tabs from the connector piece wouldn't snap into the holes on the side. Not a big deal as I just used some epoxy to glue it in place. I used the pins in the link below along with a DB-25 printer cable. Unfortunately the cable only had 18 wires in it so I had to put some on the outside as well. 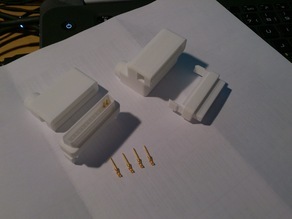 SX64_Kabel_1 - Printed horizontally with supports "Touching Buildplate". SX64_Kabel_2 - Printed vertically with the cable hole at the bottom. No supports. SX64_Kabel_3 - Printed vertically with the cable hole on the top. No supports.